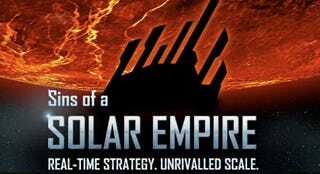 Stardock announced multiple "micro-expansions" to be available for Sins of a Solar Empire throughout the next year. The first of these expansions, Entrenchment, is currently being developed and will be available in late 2008 for $9.95. This expansion is said to add new weapon upgrades and defense platforms. Two other expansions also in the works will add new diplomacy features as well as new technologies and ships. I hope fans of the series don't mind opening their wallets! Full release after the jump.Multiple Expansion Packs Announced, First Pack Set for Late 2008 - Plymouth, MI – August 29, 2008 – Stardock announced today that the award-winning and best-selling PC strategy game, Sins of a Solar Empire, will feature several micro-expansions over the next year. The first expansion pack, Sins of a Solar Empire: Entrenchment is currently in development and will be released late 2008 for $9.95 via Stardock's Impulse digital distribution platform (www.impulsedriven.com). Developed by Ironclad Games, Sins of a Solar Empire is a real-time strategy game that adds an extreme amount of depth normally only seen in turn-based releases. One of the highest ranking real-time strategy games of 2008, the title has sold over half a million copies and won several Editor's Choice awards. Specifically, Entrenchment promises to bring fans a Starbase defense platform for each race (extremely powerful and armored bases housing a variety of weapons and other upgrades capable of defending an entire planet), turret upgrades for each race to make them more powerful (not only stronger than the current versions, but also upgradable with long-range weapons), mine fields and a Subspace Inhibitor platform that will slow enemy ships within its range. "Sins of a Solar Empire, which was already an amazing game experience, is getting some outstanding ways to conquer others or defend your race," said Stardock CEO and President Brad Wardell. "We're excited about being able to deliver expansion packs in a more modular way than traditionally. Now players can pick and choose what features they want rather than paying a higher price for a larger expansion pack which may have features they aren't interested in." Ironclad has two additional micro-expansions in development as well. One of which adds new diplomacy features to the game and another that will add new technologies and ships. The expansions are being developed to prevent fracturing of the multiplayer community. If both players have a given expansion pack installed, the features are available, but if one does not, the expansion pack features are disabled for that particular game. The expansions will be available digitally from Stardock on the Sins website as well as via Impulse, Stardock's next-generation digital distribution platform. Visit http://www.sinsofasolarempire.com for more information, updates and pre-order information. To learn more about Stardock, please visit www.stardock.com.